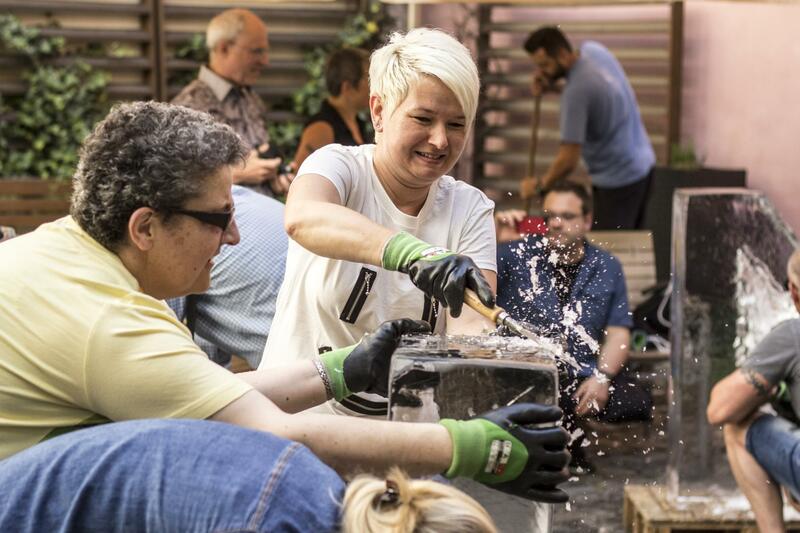 One of our favourite team building activities is our Ice Carving Challenge. Bring out your creative side as you carve out your own ice sculpture! Your creation begins with a block of solid ice. The size of one block is approximately 1 x 0.5 metres, and weighs more than 100 kilograms. 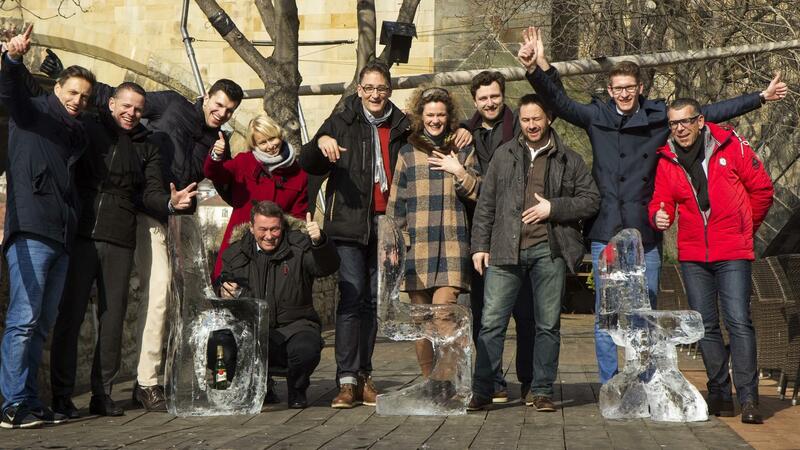 We can deliver ice blocks for ice carving to any venue, restaurant or hotel within Prague or the Czech republic. Ice carving can be done outdoors and, in some case, indoors. We have several great outdoor venues to choose from that are perfect Ice Carving locations. Guests are divided into small teams, ideally of five guests each. 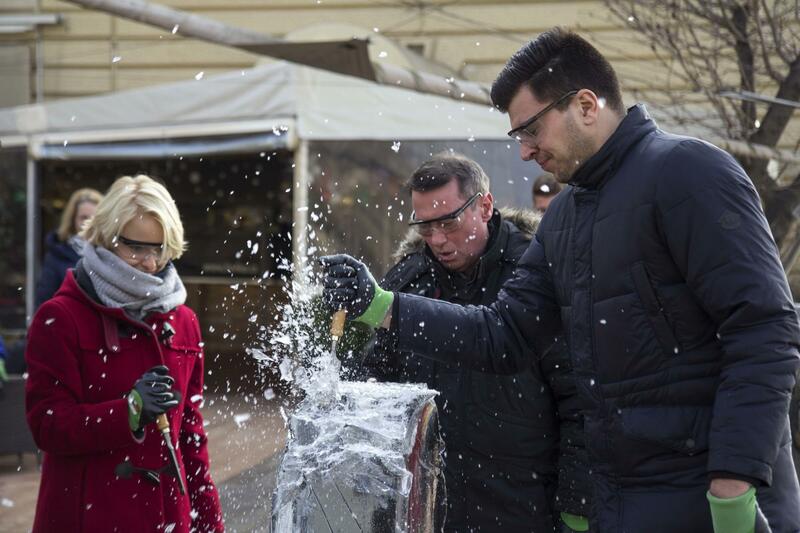 Each guest will receive safety glasses, gloves and ice sculpture tools. No, no… we don’t use chain saws! Only a simple chisel, which is ideal for carving out your ice masterpiece. Guests are given a topic (such as your corporate logo, other company-related topics or other), and the teams are charged with transforming it into reality. Within 1-1.5 hours, your excellent, jaw-dropping masterpieces will be finished… and you will be amazed at what can be expressed with ice! Ice Carving is ideal for a minimum of five guests, but can accommodate as many guests as there is space for ice blocks. This team activity is the most popular during winter months, but has been known to be an excellent “chill-out” activity over the hot summer months as well. As a premiere event organiser, our motto is always “safety first”, so our experts will always be on-site to assist. This off-beat activity is a great way to spend an afternoon for both corporate team building and other group events.